In 2010, Edrizio De La Cruz walked away from Wall Street to become an entrepreneur. As a JP Morgan investment banker, Edrizio previously led international financing deals in excess of $100 million in value. He leveraged this experience to gain admission to the Wharton School of Business, a transformational event which strengthened his resolve to become an entrepreneur. After business school, Edrizio turned his back on seductive offers from Wall Street to start his own venture. In line with Paul Graham’s essays, Edrizio focused on mobile remittances in developing markets, a $410 billion market worldwide. So in 2012, Edrizio and his co-founders Inigo and Juan started Regalii to help immigrants support their loved ones back home. Unfortunately however, their first attempt was less than successful. A second attempt in early 2013 failed as well. Nonetheless, Regalii had the support of Banco Itau CEO Ricardo Villela Marino, an early investor who believed strongly in their vision. With Ricardo’s faith, Edrizio and his team were relentless in the face of adversity, lasting two years with zero salary and sleeping on the floor of a ramshackle apartment on 168th street in Washington Heights. Then in April 2013, the Regalii team received an invitation to present at YCombinator. Recognizing a key inflection point, Edrizio and his co-founders prepared for five days straight and interviewed with seven YC partners in Silicon Valley. YC was so impressed with the team’s integrity, passion and vision that they accepted Regalii at once. With YC’s guidance, the Regalii team progressed from 5 users to 3,000 users within three months. In autumn 2013, Regalii reached the finals at TechCrunch Disrupt and subsequently raised $2.7 million from a syndicate led by Kapor Capital. 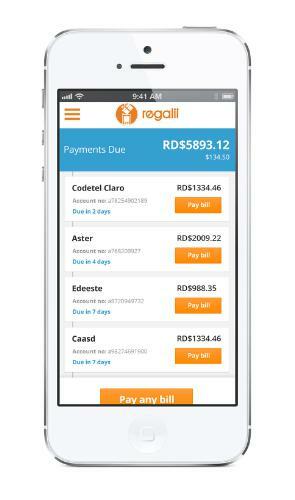 Today, Regalii has over 50,000 users in the Dominican Republic, with plans to expand to El Salvador, Guatemala, Honduras and Mexico later this year. The team is well-positioned to become the leading mobile finance app for families in Latin America. Thank you for sharing your story with us, Edrizio. All the best with your venture, the world needs you!